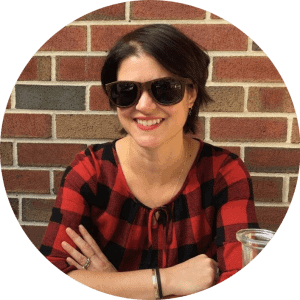 Today’s guest post takes us around the world courtesy of Heather Teoh, founding volunteer and Wonton Web Correspondent of California Food Literacy Center. Understandably proud of her food heritage, she aspires to take local and sustainable ingredients and transform them into Southeast Asian cuisine and other global treats. Singapore is an island nation in Southeast Asia, tucked in between Malaysia and Indonesia. It’s literally a dot on the world map! It may only be 255 square miles in size but it has whopping 6,500 food and beverage establishments. In essence, people here love to eat. When I travel, I always want to find out where the locals eat. They always know which restaurants serve the tastiest, most authentic, and affordable dishes—and in Singapore, locals typically eat at hawker centers. They are open-air complexes with dozens of stalls selling various regional dishes. Each stall will have its own specialty, be it curry noodles or chicken rice, and some recipes are passed down from generation to generation. Everything is inexpensive and incredibly delicious! 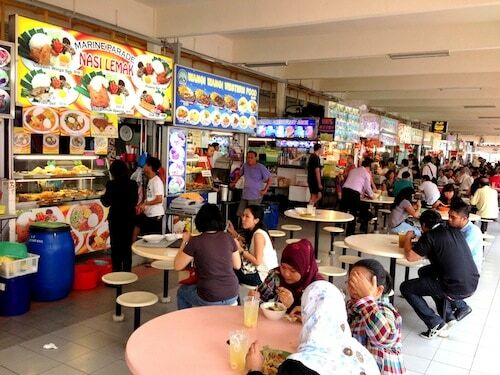 Whether or not it is a weekday or weekend morning, you will see throngs of people eating breakfast in a hawker center. The weather in Singapore is typically a muggy 90 degrees year-round but that doesn’t stop locals from enjoying a bowl of hot rice porridge or spicy curry for breakfast. Chinese immigrants created Chwee Kueh (Chinese dialect for “water rice cake”, shown above) when they emigrated here. It’s made of rice flour and water, and steamed to a soft and slightly glutinous texture. 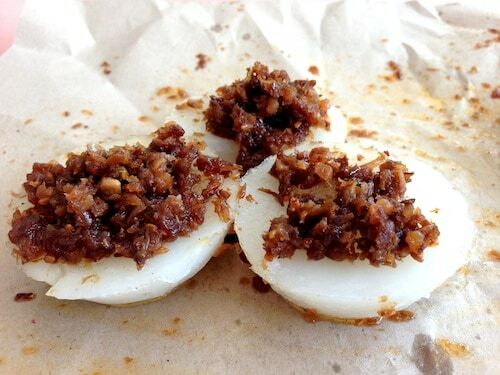 It’s then topped with fried preserved radish and chili paste that gives chwee kueh its flavor. Chwee kueh is a dish that’s really popular with kids due to its soft texture and salty topping, and is also incredibly cheap at $1 for a plate of four pieces. Chinese immigrants also brought a whole host of noodle dishes that became a staple in Singaporean cuisine. 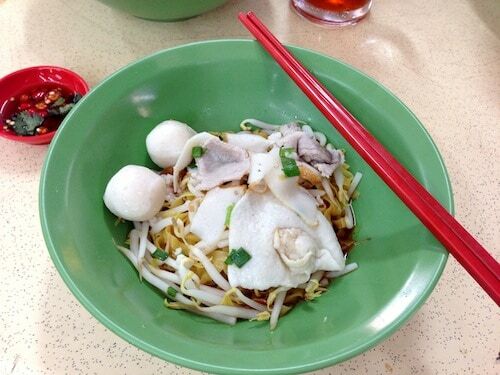 Mee Pok (shown above) is a flat yellow noodle resembling fettucine but with a lighter texture. It’s served with a sauce made of vinegar, soy sauce and chili, and topped with pork and fish balls (made of fish meat and flour, they’re salty, bouncy and delicious). Spicy with a kick of vinegar, this dish is a popular fixture at hawker centers. Nasi Lemakis a Malay dish that’s made of rice cooked in coconut milk and topped with fried anchovies with peanuts and sambal. They’re typically wrapped in banana leaves and sold in hawker centers. The coconut rice is fragrant yet mild enough to accompany the stronger flavors of the anchovies and spicy chili paste. 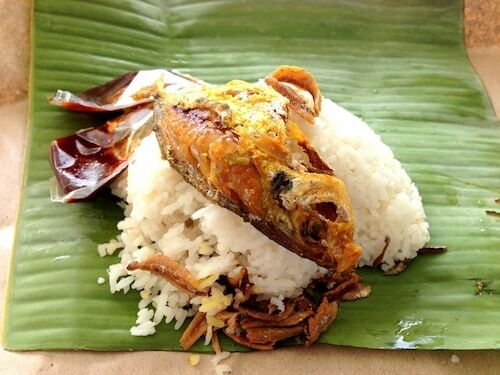 The best way to enjoy nasi lemak is to eat it with your fingers! Roti Prata is probably one of the most popular breakfast dishes in Singapore. It’s a flaky, savory Indian pancake that we enjoy with a side of curry. Indian immigrants adapted recipes from their homeland and created roti prata. Apparently you can’t even find the dish in India. It has a crispy yet soft texture that bodes well when dipped in spicy fish or chicken curry. If you get the chance to visit Singapore, definitely ask locals where they go for a good hearty breakfast. Everyone has a passionate opinion on where to go and what to order, and you really can’t go wrong eating at any of our hawker centers!